At Finders Keepers we pride ourselves on being property management experts. Our teams are qualified, based locally to the properties they manage, look after the full tenancy lifecycle (from check-in to check-out) and are on call 24/7/365. Thanks to this ‘hands-on’ approach to managing landlords’ properties, we are sometimes called upon as the fourth emergency service. 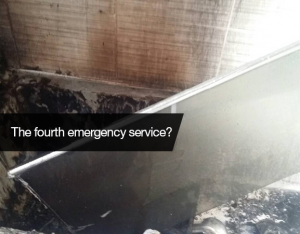 At around 9pm on Christmas Day last year Michelle Horner, Deputy Office Manager in Bicester, took a call on the emergency line from a tenant to let us know that they’d had to call the fire service as there had been a fire in the bathroom of their brand new 3 bedroom house in Bodicote. Michelle got to work to secure alternative accommodation for the young family, liaised with the landlord to keep him updated and visited the property herself on Boxing Day to assess the situation. A hotel was arranged for the short-term, but that is not the ideal situation for a couple with two small children who had been living in a 3 bedroom, 2 bathroom new build house. When our offices re-opened Michelle gave Jacky Thornhill (who usually manages the property) a thorough handover of the situation and Jacky then set about sourcing a longer-term accommodation solution. Our Banbury office had a suitable property – a 3 bedroom townhouse in Banbury – listed, which was about to become vacant in early January. Jacky called the landlord and negotiated a 3 month let while the original house had repair works carried out, including a full redecoration and new bathroom. Not only did this solve the problem for the tenants, but it meant the landlord of the vacant property was receiving income and it brought the property to a better time of year for letting. Once all the work was completed, the tenants were moved back into the original property and the Banbury letting team found tenants for the Banbury townhouse.